Here is a story of DL Moody to encourage your children’s ministry workers. It teaches that there is always hope for every child to make Jesus their Lord and Savior. “Difficult” children have run up and down the halls of churches for centuries. Our generation is not the first to learn how to love the unloveable and ours won’t be the last. But are these children who try our patience out of reach of Jesus’ loving arms? Absolutely not. Jesus knows the hearts of these children and He knows all that they need. And yes, even the most unruly child in our classrooms can be touched by the Spirit of God. Take for example, DL Moody. I can truly say that I have seen few persons whose minds were spiritually darker than was his when he came into my Sunday school class and I think the committee of the church seldom met an applicant for membership who seemed more unlikely ever to become a Christian of clear and decided views of Gospel truth, still less to fill any space of public or extended usefulness. Who was that boy? Why none other than D. L. Moody. By God’s grace he was transformed into one of the most effective servants of God. What a great story! DL Moody was a “difficult” child and tested the patience of his teachers. But thank the Lord, there was a faithful servant of God who shared the gospel with him. So, my dear fellow teachers, stay strong, keep praying and keep sharing. You never know, you might have the next “DL Moody” or “Billy Graham” in your class. 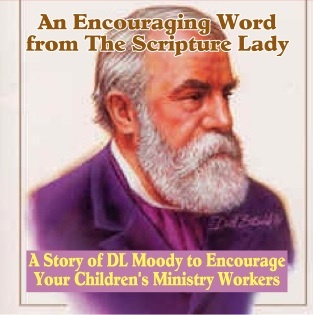 If you liked this story of DL Moody to encourage your children’s ministry workers, then sign up to receive Scripture Lady’s Free Email Kid Tips packed full with creative ideas and receive 12 FREE Bible downloadable resources to help get the kids you minister to excited about the Bible! Just go to www.MyFreeBibleGames.com to fully subscribe.